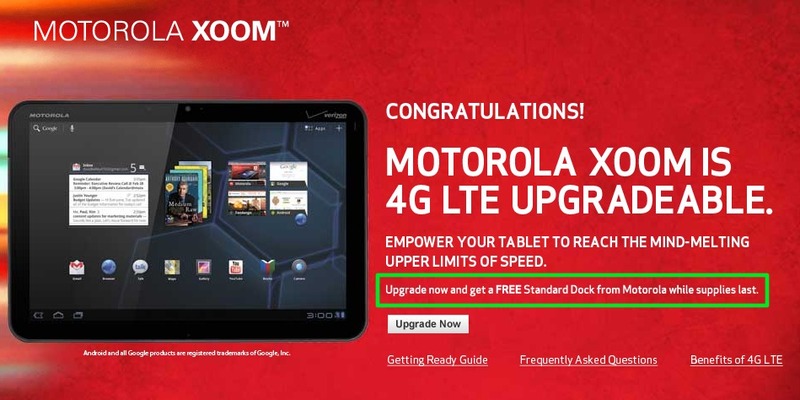 Verizon announced that the Motorola XOOM 4G LTE upgrade would begin today and it looks like they kept their word on that. If you head to the link below, you’ll see that the email sign-up page has been changed to “Upgrade Now.” I would suggest that you hurry since they appear to be handing out Standard Docks to the first set of people that fill out their upgrade form. When it asks for your IMEI/MEID, you can find it on your XOOM under Settings>About>Status.